Discussion in 'Effects, Pedals, Strings & Things' started by Porrig, Feb 4, 2012. 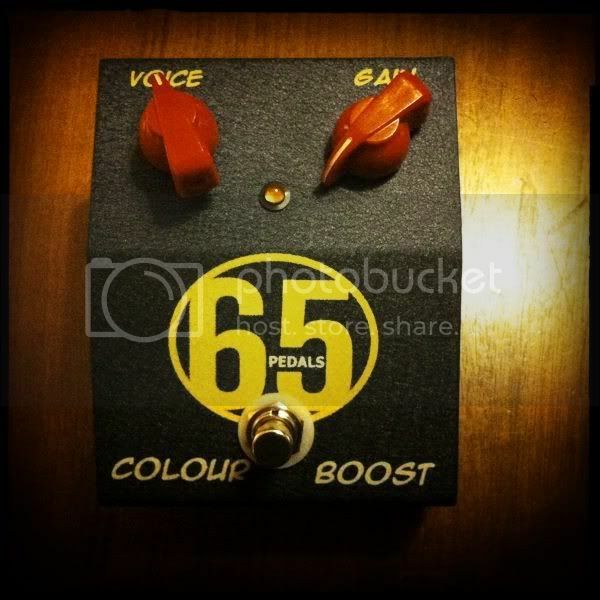 My 65 Amps Colour Booster. LOVE it. Congrats, how do you like it so far? I've had it since Saturday afternoon and have had about 8 hours of practice time with it so far. Using it in front of a Bugera V5 and with either a p90 loaded telecaster / Squire CV 50 tele and a Sparrow big daddy with GFS surf 90's. DAMN impressed by this pedal. Very simple to use - 4 voicings (combinations of cutting/keeping the lows and boosting the treble in various degrees) and a gain control so I can get from clean edgy chime to warm dark grit and drive dead easily with all sorts of goodies along the way. Top class treble booster! Cool. Is that a new color? Thought they were blue..
Ahhh. I see. haha I think it looks cooler that way.